Marla has been sharing the Clear & SIMPLE Way to clear your clutter and get organized for over 14 years. She has changed lives in places such as Barnes & Noble, Wild Oats, the Salt Lake Home Show, local libraries and many more. Marla’s passion for speaking in the community can be measured by her monthly appearances anywhere the Clear & SIMPLE Message is needed. She shares that her life long fear of speaking melted away when she gave her first clutter clearing presentation. It was the pain in the people’s faces and stories that struck a deep chord. She has been speaking ever since! Our advanced training programs are designed for professional organizers who are ready to specialize. Add a new income stream, receive credentials in specific approaches and benefit from in-depth training with other experts. Some of the offerings include FreedomFiler, Train the Trainer and Ideal Life Vision. This powerful & popular training is now offered virtually as a self study for the first time. You get to go through the material and schedule your one-on-one sessions on your time table. Taught by Marla Dee, CPO and FreedomFiler Certified Trainer. 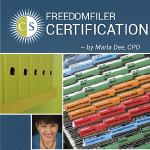 This is an in depth training of FreedomFiler, the world’s best all encompassing, self purging filing system for home or small business. By choosing Clear & SIMPLE for your training you will also receive a BONUS GIFT of Get Organized, the Clear & SIMPLE Way audiobook, by Marla Dee. We have a couple of questions for you before we begin.  What is your experience so far with Freedom Filer?  Have you bought a kit for yourself and put it together?  Have you set it up for a client?  Why are you taking this training?  Do you have any specific questions related to FreedomFiler? This Virtual Training is given in three modules together with self study work. Following your sessions, you will complete a written self exam and verbal exam with Seth Odam. Upon completion of these exercises you will be certified. FreedomFiler offers a tremendous support system for you and your clients. Thank you for allowing me to share this fantastic system with you! If you would like information on any other Advanced Trainings please contact our office directly. Marla is the creator of the Clear & SIMPLE Systems, a step-by-step approach to getting and staying organized. In this time of overwhelming incoming information and expectations for our time, her message is needed more than ever. Give your business and your employees the very best training for getting their paper, office, systems, and time organized. Organization is a critical element in how much work gets down, employee fulfillment and customer satisfaction. Marla can offer your group a simple lunch bag message up to an entire day retreat. Marla Dee has trained with organizations such as The State of Utah, the VA Hospital, ARUP Laboratories, Utah State Bar Association, IRS, UTA and many others. She would bring expertise, humor, real life solutions and change to your business. Contact Clear & SIMPLE to explore how your business or group can best be served by getting organized, the Clear & SIMPLE Way! 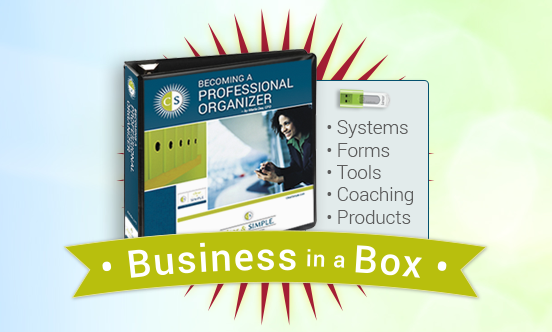 Become a Clear & SIMPLE Certified Organizer™ and an expert in your area! The Certification Course is 60+ hours of training. It follows The Foundation Course and builds upon what you learned there. This training brings in depth, application, marketing, branding and time with the experts. Now offered LIVE in Salt Lake City – or – soon offered in Mexico and Seattle area. Our Professional Organizer Training Program is highly acclaimed and unique in the industry. It is the only organizer training that has been in place since January of 2003. This trademarked credential as a Clear & SIMPLE Certified™ Organizer | CSCO™ will set you apart as an expert in your field and connect you with a circle of organizers around the world. The training is taught by Marla Dee and her team of professionals. and lastly, the inspiration to create your business – your way! What sets Clear & SIMPLE apart from others is the very best SYSTEMS & TOOLS in the industry today! Because we have been training organizers for 11 years we know your needs, your questions and your doubts. Your training includes an in depth manual, expert instruction from Marla Dee, personal coaching, a hand’s on project, forms, and follow up. Contact us at [email protected] to get all the juicy details and ask us all your questions. $4250 for 3 Day LIVE PERSONAL Training Enroll Now! $4950 for 5 Day LIVE GROUP Training ** Pay Your Deposit! ** Connect with us for dates and more information about the next 5 Day Live Training. Hear from Marla Dee as she walks you through Staying in Business a Decade & Beyond! Launch Your Business with Confidence! Get what you need to really stand out, attract your ideal clients and generate income in just a few weeks. This is an excellent time to have an organizing business. Are you ready to launch an exciting, rewarding Professional Organizing Business? Come join the Clear & SIMPLE Circle of Organizers and make your dream a reality! Skip the years it takes to come up with a successful, highly-functioning systems by taking Clear & SIMPLE’s Self Study Course. For over a decade, we have been training professional organizers around the world. We are very proud of our successful organizers in 7 countries. This Course is a Self Study allowing you to do at on your own timing. However, you also get expert guidance and one-on-one coaching through all the levels of learning. It is also the prerequisite for Levels 2 & 3. ** ** Please note that before we ship your course you will need to sign Our Copyright Agreement. Shipping and handling is an additional cost, billed separately through PayPal. Within the U.S. $35. We DO ship internationally, please contact us at [email protected] for more information. Upon completion of each module, you can take the exam and receive a Certificate of Completion, along with the credential of Clear & SIMLE Organizer. This tells the outside world and your clients that you have done training in a methodology and can offer professional systems.